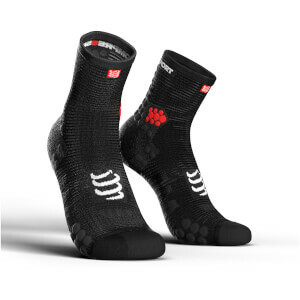 Tested and approved by top athletes, adopted by Pro Tour riders, these new ultralight pro racing socks, in ultra low cut, offer extreme freshness and lightness in 12 grams of fabric. Your feet remain ultra-fresh, get ultimate ventilation and are ready to go for the fastest of runs. This run low version is specifically dedicated to those athletes who like to wear ultra-low socks while at the same time looking for maximum comfort. These racing socks have been approved since they hit the market because never has a sock been that light. You just fly in them! The 3D.DOTS are multidirectional and ensure maximum grip in shoes thereby preventing feet from slipping during effort. 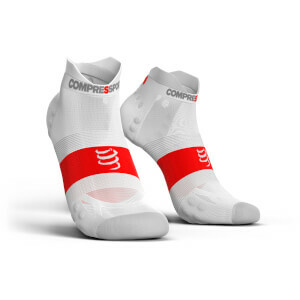 The 360° compression dampens the "shock wave" effect on muscles, veins and joints. Air enters the product which prevents the sole of the foot from overheating during effort. The 3-D dots do not retain water (rain,hydration, perpiration) and facilitate its discharge. Feet stay dry. More protection against impacts that might damage your nails.